Giacomo Maraldi determined in 1704 that the southern cap is not centered on the rotational pole of Mars. During the opposition of 1719, Maraldi observed both polar caps and temporal variability in their extent. William Herschel was the first to deduce the low density of the Martian atmosphere in his 1784 paper entitled On the remarkable appearances at the polar regions on the planet Mars, the inclination of its axis, the position of its poles, and its spheroidal figure; with a few hints relating to its real diameter and atmosphere. When Mars appeared to pass close by two faint stars with no effect on their brightness, Herschel correctly concluded that this meant that there was little atmosphere around Mars to interfere with their light. Honore Flaugergues's 1809 discovery of "yellow clouds" on the surface of Mars is the first known observation of Martian dust storms. Flaugergues also observed in 1813 significant polar-ice waning during Martian springtime. His speculation that this meant that Mars was warmer than Earth proved inaccurate. There are two dating systems now in use for Martian geological time. One is based on crater density and has three ages: Noachian, Hesperian, and Amazonian. The other is a mineralogical timeline, also having three ages: Phyllocian, Theikian, and Siderikian. Recent observations and modeling are producing information not only about the present climate and atmospheric conditions on Mars but also about its past. The Noachian-era Martian atmosphere had long been theorized to be carbon dioxide–rich. Recent spectral observations of deposits of clay minerals on Mars and modeling of clay mineral formation conditions have found that there is little to no carbonate present in clay of that era. Clay formation in a carbon dioxide–rich environment is always accompanied by carbonate formation, although the carbonate may later be dissolved by volcanic acidity. The discovery of water-formed minerals on Mars including hematite and jarosite, by the Opportunity rover and goethite by the Spirit rover, has led to the conclusion that climatic conditions in the distant past allowed for free-flowing water on Mars. The morphology of some crater impacts on Mars indicate that the ground was wet at the time of impact. Geomorphic observations of both landscape erosion rates and Martian valley networks also strongly imply warmer, wetter conditions on Noachian-era Mars (earlier than about four billion years ago). However, chemical analysis of Martian meteorite samples suggests that the ambient near-surface temperature of Mars has most likely been below 0 °C (32 °F) for the last four billion years. Some scientists maintain that the great mass of the Tharsis volcanoes has had a major influence on Mars's climate. Erupting volcanoes give off great amounts of gas, mainly water vapor and CO2. Enough gas may have been released by volcanoes to have made the earlier Martian atmosphere thicker than Earth's. The volcanoes could also have emitted enough H2O to cover the whole Martian surface to a depth of 120 m (390 ft). Carbon dioxide is a greenhouse gas that raises a planet's temperature: it traps heat by absorbing infrared radiation. Thus, Tharsis volcanoes, by giving off CO2, could have made Mars more Earth-like in the past. Mars may have once had a much thicker and warmer atmosphere, and oceans or lakes may have been present. It has, however, proven extremely difficult to construct convincing global climate models for Mars which produce temperatures above 0 °C (32 °F) at any point in its history, although this may simply reflect problems in accurately calibrating such models. Evidence of a geologically recent, extreme ice age on Mars was published in 2016. Just 370,000 years ago, the planet would have appeared more white than red. Mars's temperature and circulation vary every Martian year (as expected for any planet with an atmosphere and axial tilt). Mars lacks oceans, a source of much interannual variation on Earth. [clarification needed] Mars Orbiter Camera data beginning in March 1999 and covering 2.5 Martian years show that Martian weather tends to be more repeatable and hence more predictable than that of Earth. If an event occurs at a particular time of year in one year, the available data (sparse as it is) indicate that it is fairly likely to repeat the next year at nearly the same location, give or take a week. On September 29, 2008, the Phoenix lander took pictures of snow falling from clouds 4.5 kilometres (2.8 mi) above its landing site near Heimdal Crater. The precipitation vaporized before reaching the ground, a phenomenon called virga. Martian dust storms can kick up fine particles in the atmosphere around which clouds can form. These clouds can form very high up, up to 100 km (62 mi) above the planet. The clouds are very faint and can only be seen reflecting sunlight against the darkness of the night sky. In that respect, they look similar to mesospheric clouds, also known as noctilucent clouds, on Earth, which occur about 80 km (50 mi) above our planet. Measurements of Martian temperature predate the Space Age. However, early instrumentation and techniques of radio astronomy produced crude, differing results. Early flyby probes (Mariner 4) and later orbiters used radio occultation to perform aeronomy. With chemical composition already deduced from spectroscopy, temperature and pressure could then be derived. Nevertheless, flyby occultations can only measure properties along two transects, at their trajectories' entries and exits from Mars' disk as seen from Earth. This results in weather "snapshots" at a particular area, at a particular time. Orbiters then increase the number of radio transects. Later missions, starting with the dual Mariner 6 and 7 flybys, plus the Soviet Mars 2 and 3, carried infrared detectors to measure radiant energy. Mariner 9 was the first to place an infrared radiometer and spectrometer in Mars orbit in 1971, along with its other instruments and radio transmitter. Viking 1 and 2 followed, with not merely Infrared Thermal Mappers (IRTM). The missions could also corroborate these remote sensing datasets with not only their in situ lander metrology booms, but with higher-altitude temperature and pressure sensors for their descent. Differing in situ values have been reported for the average temperature on Mars, with a common value being −63 °C (210 K; −81 °F). Surface temperatures may reach a high of about 20 °C (293 K; 68 °F) at noon, at the equator, and a low of about −153 °C (120 K; −243 °F) at the poles. Actual temperature measurements at the Viking landers' site range from −17.2 °C (256.0 K; 1.0 °F) to −107 °C (166 K; −161 °F). The warmest soil temperature estimated by the Viking Orbiter was 27 °C (300 K; 81 °F). The Spirit rover recorded a maximum daytime air temperature in the shade of 35 °C (308 K; 95 °F), and regularly recorded temperatures well above 0 °C (273 K; 32 °F), except in winter. It has been reported that "On the basis of the nightime air temperature data, every northern spring and early northern summer yet observed were identical to within the level of experimental error (to within ±1 °C)" but that the "daytime data, however, suggest a somewhat different story, with temperatures varying from year-to-year by up to 6 °C in this season. This day-night discrepancy is unexpected and not understood". In southern spring and summer, variance is dominated by dust storms which increase the value of the night low temperature and decrease the daytime peak temperature. This results in a small (20 °C) decrease in average surface temperature, and a moderate (30 °C) increase in upper atmosphere temperature. Before and after the Viking missions, newer, more advanced Martian temperatures were determined from Earth via microwave spectroscopy. As the microwave beam, of under 1 arcminute, is larger than the disk of the planet, the results are global averages. Later, the Mars Global Surveyor's Thermal Emission Spectrometer and to a lesser extent 2001 Mars Odyssey's THEMIS could not merely reproduce infrared measurements but intercompare lander, rover, and Earth microwave data. The Mars Reconnaissance Orbiter's Mars Climate Sounder can similarly derive atmospheric profiles. The datasets "suggest generally colder atmospheric temperatures and lower dust loading in recent decades on Mars than during the Viking Mission," although Viking data had previously been revised downward. The TES data indicates "Much colder (10–20 K) global atmospheric temperatures were observed during the 1997 versus 1977 perihelion periods" and "that the global aphelion atmosphere of Mars is colder, less dusty, and cloudier than indicated by the established Viking climatology," again, taking into account the Wilson and Richardson revisions to Viking data. A later comparison, while admitting "it is the microwave record of air temperatures which is the most representative," attempted to merge the discontinuous spacecraft record. No measurable trend in global average temperature between Viking IRTM and MGS TES was visible. "Viking and MGS air temperatures are essentially indistinguishable for this period, suggesting that the Viking and MGS eras are characterized by essentially the same climatic state." It found "a strong dichotomy" between the northern and southern hemispheres, a "very asymmetric paradigm for the Martian annual cycle: a northern spring and summer which is relatively cool, not very dusty, and relatively rich in water vapor and ice clouds; and a southern summer rather similar to that observed by Viking with warmer air temperatures, less water vapor and water ice, and higher levels of atmospheric dust." The Mars Reconnaissance Orbiter MCS (Mars Climate Sounder) instrument was, upon arrival, able to operate jointly with MGS for a brief period; the less-capable Mars Odyssey THEMIS and Mars Express SPICAM datasets may also be used to span a single, well-calibrated record. While MCS and TES temperatures are generally consistent, investigators report possible cooling below the analytical precision. "After accounting for this modeled cooling, MCS MY 28 temperatures are an average of 0.9 (daytime) and 1.7 K (night-time) cooler than TES MY 24 measurements." It has been suggested that Mars had a much thicker, warmer atmosphere early in its history. Much of this early atmosphere would have consisted of carbon dioxide. Such an atmosphere would have raised the temperature, at least in some places, to above the freezing point of water. With the higher temperature running water could have carved out the many channels and outflow valleys that are common on the planet. It also may have gathered together to form lakes and maybe an ocean. Some researchers have suggested that the atmosphere of Mars may have been many times as thick as the Earth's; however research published in September 2015 advanced the idea that perhaps the early Martian atmosphere was not as thick as previously thought. The Martian atmosphere is composed mainly of carbon dioxide and has a mean surface pressure of about 600 pascals (Pa), much lower than the Earth's 101,000 Pa. One effect of this is that Mars' atmosphere can react much more quickly to a given energy input than that of Earth's atmosphere. As a consequence, Mars is subject to strong thermal tides produced by solar heating rather than a gravitational influence. These tides can be significant, being up to 10% of the total atmospheric pressure (typically about 50 Pa). Earth's atmosphere experiences similar diurnal and semidiurnal tides but their effect is less noticeable because of Earth's much greater atmospheric mass. Although the temperature on Mars can reach above freezing (0 °C (273 K; 32 °F)), liquid water is unstable over much of the planet, as the atmospheric pressure is below water's triple point and water ice sublimes into water vapor. Exceptions to this are the low-lying areas of the planet, most notably in the Hellas Planitia impact basin, the largest such crater on Mars. It is so deep that the atmospheric pressure at the bottom reaches 1155 Pa, which is above the triple point, so if the temperature exceeded 0 °C liquid water could exist there. Curiosity rover's parachute flapping in the Martian wind (HiRISE/MRO) (August 12, 2012 to January 13, 2013). Martian Dust Devil – in Amazonis Planitia (April 10, 2001) (also) (video (02:19)). The surface of Mars has a very low thermal inertia, which means it heats quickly when the sun shines on it. Typical daily temperature swings, away from the polar regions, are around 100 K. On Earth, winds often develop in areas where thermal inertia changes suddenly, such as from sea to land. There are no seas on Mars, but there are areas where the thermal inertia of the soil changes, leading to morning and evening winds akin to the sea breezes on Earth. The Antares project "Mars Small-Scale Weather" (MSW) has recently identified some minor weaknesses in current global climate models (GCMs) due to the GCMs' more primitive soil modeling. "Heat admission to the ground and back is quite important in Mars, so soil schemes have to be quite accurate." Those weaknesses are being corrected and should lead to more accurate future assessments, but make continued reliance on older predictions of modeled Martian climate somewhat problematic. At low latitudes the Hadley circulation dominates, and is essentially the same as the process which on Earth generates the trade winds. At higher latitudes a series of high and low pressure areas, called baroclinic pressure waves, dominate the weather. Mars is drier and colder than Earth, and in consequence dust raised by these winds tends to remain in the atmosphere longer than on Earth as there is no precipitation to wash it out (excepting CO2 snowfall). One such cyclonic storm was recently captured by the Hubble Space Telescope (pictured below). One of the major differences between Mars' and Earth's Hadley circulations is their speed which is measured on an overturning timescale. The overturning timescale on Mars is about 100 Martian days while on Earth, it is over a year. When the Mariner 9 probe arrived at Mars in 1971, the world expected to see crisp new pictures of surface detail. Instead they saw a near planet-wide dust storm with only the giant volcano Olympus Mons showing above the haze. The storm lasted for a month, an occurrence scientists have since learned is quite common on Mars. Using data from Mariner 9, James B. Pollack et al. proposed a mechanism for Mars dust storms in 1973. Locations of Opportunity and Curiosity rovers are noted (MRO). Time-lapse composite of Martian horizon over 30 Martian days shows how much sunlight the July 2007 dust storms blocked; Tau of 4.7 indicates 99% blocked. As observed by the Viking spacecraft from the surface, "during a global dust storm the diurnal temperature range narrowed sharply, from 50° Celsius to only about ten degrees, and the wind speeds picked up considerably—indeed, within only an hour of the storm's arrival they had increased to 17 m/s (61 km/h), with gusts up to 26 m/s (94 km/h). Nevertheless, no actual transport of material was observed at either site, only a gradual brightening and loss of contrast of the surface material as dust settled onto it." On June 26, 2001, the Hubble Space Telescope spotted a dust storm brewing in Hellas Basin on Mars (pictured right). A day later the storm "exploded" and became a global event. Orbital measurements showed that this dust storm reduced the average temperature of the surface and raised the temperature of the atmosphere of Mars by 30 K. The low density of the Martian atmosphere means that winds of 18 to 22 m/s (65 to 79 km/h) are needed to lift dust from the surface, but since Mars is so dry, the dust can stay in the atmosphere far longer than on Earth, where it is soon washed out by rain. The season following that dust storm had daytime temperatures 4 K below average. This was attributed to the global covering of light-colored dust that settled out of the dust storm, temporarily increasing Mars' albedo. In mid-2007 a planet-wide dust storm posed a serious threat to the solar-powered Spirit and Opportunity Mars Exploration Rovers by reducing the amount of energy provided by the solar panels and necessitating the shut-down of most science experiments while waiting for the storms to clear. Following the dust storms, the rovers had significantly reduced power due to settling of dust on the arrays. Dust storms are most common during perihelion, when the planet receives 40 percent more sunlight than during aphelion. During aphelion water ice clouds form in the atmosphere, interacting with the dust particles and affecting the temperature of the planet. A large intensifying dust storm began in late-May 2018 and had persisted as of mid-June. By 10 June 2018, as observed at the location of the rover Opportunity, the storm was more intense than the 2007 dust storm endured by Opportunity. On 20 June 2018, NASA reported that the dust storm had grown to completely cover the entire planet. It has been suggested that dust storms on Mars could play a role in storm formation similar to that of water clouds on Earth. Observation since the 1950s has shown that the chances of a planet-wide dust storm in a particular Martian year are approximately one in three. Dust storms contribute to water loss on Mars. A study of dust storms with the Mars Reconnaissance Orbiter suggested that 10 percent of the water loss from Mars may have been caused by dust storms. Instruments on board the Mars Reconnaissance Orbiter detected observed water vapor at very high altitudes during global dust storms. Ultraviolet light from the sun can then break the water apart into hydrogen and oxygen. The hydrogen from the water molecule then escapes into space. It is thought that Martian dust storms can lead to atmospheric electricity phenomena. Dust grains are known to become electrically charged upon colliding with the ground or with other grains. Theoretical, computational and experimental analyses of lab-scale dusty flows and full-scale dust devils on Earth indicate that self-induced electricity, including lightning, is a common phenomenon in turbulent flows laden with dust . On Mars, this tendency would be compounded by the low pressure of the atmosphere, which would translate into much lower electric fields required for breakdown. As a result, aerodynamic segregation of dust at both meso- and macro-scales could easily lead to a sufficiently large separation of charges to produce local electrical breakdown in dust clouds above the ground . Nonetheless, in contrast to other planets in the Solar System, no in-situ measurements exist on the surface of Mars to prove these theories . The first attempt to elucidate these unknowns was made by the Schiaparelli EDM lander of the ExoMars mission in 2016, which included relevant onboard hardware to measure dust electric charges and atmospheric electric fields on Mars. However, the lander failed during the automated landing on 19 October 2016 and crashed on the surface of Mars. The process of geological saltation is quite important on Mars as a mechanism for adding particulates to the atmosphere. Saltating sand particles have been observed on the MER Spirit rover. Theory and real world observations have not agreed with each other, classical theory missing up to half of real-world saltating particles. A new model more closely in accord with real world observations demonstrates that saltating particles create an electrical field that increases the saltation effect. Mars grains saltate in 100 times higher and longer trajectories and reach 5–10 times higher velocities than Earth grains do. A large doughnut shaped cloud appears in North polar region of Mars around the same time every Martian year and of about the same size. It forms in the morning and dissipates by the Martian afternoon. The outer diameter of the cloud is roughly 1,600 km (1,000 mi), and the inner hole or eye is 320 km (200 mi) across. The cloud is thought to be composed of water-ice, so it is white in color, unlike the more common dust storms. It looks like a cyclonic storm, similar to a hurricane, but it does not rotate. The cloud appears during the northern summer and at high latitude. Speculation is that this is due to unique climate conditions near the northern pole. Cyclone-like storms were first detected during the Viking orbital mapping program, but the northern annular cloud is nearly three times larger. The cloud has also been detected by various probes and telescopes including the Hubble and Mars Global Surveyor. Other repeating events are dust storms and dust devils. Although methane is a greenhouse gas on Earth, the small amounts that have been claimed to be present on Mars would have little effect on the Martian global climate. Trace amounts of methane (CH4) at concentration of several parts per billion (ppb), were first reported in the atmosphere of Mars by a team at the NASA Goddard Space Flight Center in 2003. In March 2004 the Mars Express Orbiter and ground-based observations from Canada-France-Hawaii Telescope also suggested the presence of methane in the atmosphere with a mole fraction of about 10 nmol/mol. However, the complexity of these observations has sparked discussion as to the reliability of the results. Since breakup of that much methane by ultraviolet light would only take 350 years under current Martian conditions, if methane is present some sort of active source must be replenishing the gas. Clathrate hydrates, or water-rock reactions could be possible geological sources of methane but there is presently no consensus on the source or existence of Martian methane. The Curiosity rover landed on Mars in August 2012. It is able to make precise abundance measurements and also distinguish between different isotopologues of methane. The first measurements with the Tunable Laser Spectrometer (TLS) indicate that there is less than 5 ppb of methane at the landing site. On September 19, 2013 NASA scientists used further measurements from Curiosity to report a non-detection of atmospheric methane with a measured value of 6999180000000000000♠0.18±0.67 ppbv corresponding to an upper limit of 1.3 ppbv (95% confidence limit). The Indian Mars Orbiter Mission, launched on November 5, 2013, will attempt to detect and map the sources of methane, if they exist. The ExoMars Trace Gas Orbiter planned to launch in 2016 would further study the methane, as well as its decomposition products such as formaldehyde and methanol. Mars Reconnaissance Orbiter images suggest an unusual erosion effect occurs based on Mars' unique climate. Spring warming in certain areas leads to CO2 ice subliming and flowing upwards, creating highly unusual erosion patterns called "spider gullies". Translucent CO2 ice forms over winter and as the spring sunlight warms the surface, it vaporizes the CO2 to gas which flows uphill under the translucent CO2 ice. Weak points in that ice lead to CO2 geysers. Martian storms are significantly affected by Mars' large mountain ranges. Individual mountains like record holding Olympus Mons (26 km (85,000 ft)) can affect local weather but larger weather effects are due to the larger collection of volcanoes in the Tharsis region. One unique repeated weather phenomenon involving mountains is a spiral dust cloud that forms over Arsia Mons. The spiral dust cloud over Arsia Mons can tower 15 to 30 km (49,000 to 98,000 ft) above the volcano. Clouds are present around Arsia Mons throughout the Martian year, peaking in late summer. Clouds surrounding mountains display a seasonal variability. Clouds at Olympus Mons and Ascreaus Mons appear in northern hemisphere spring and summer, reaching a total maximum area of approximately 900,000 km2 and 1,000,000 km2 respectively in late spring. Clouds around Alba Patera and Pavonis Mons show an additional, smaller peak in late summer. Very few clouds were observed in winter. Predictions from the Mars General Circulation Model are consistent with these observations. How Mars might have looked during an ice age between 2.1 million and 400,000 years ago, when Mars's axial tilt is thought to have been larger than today. HiRISE image of "dark dune spots" and fans formed by eruptions of CO2 gas geysers on Mars' south polar ice sheet. Mars has ice caps at its north pole and south pole, which mainly consist of water ice; however, there is frozen carbon dioxide (dry ice) present on their surfaces. Dry ice accumulates in the north polar region (Planum Boreum) in winter only, subliming completely in summer, while the south polar region additionally has a permanent dry ice cover up to eight meters (25 feet) thick. This difference is due to the higher elevation of the south pole. So much of the atmosphere can condense at the winter pole that the atmospheric pressure can vary by up to a third of its mean value. This condensation and evaporation will cause the proportion of the noncondensable gases in the atmosphere to change inversely. The eccentricity of Mars's orbit affects this cycle, as well as other factors. In the spring and autumn wind due to the carbon dioxide sublimation process is so strong that it can be a cause of the global dust storms mentioned above. The northern polar cap has a diameter of approximately 1,000 km during the northern Mars summer, and contains about 1.6 million cubic kilometres of ice, which if spread evenly on the cap would be 2 km thick. (This compares to a volume of 2.85 million cubic kilometres for the Greenland ice sheet.) The southern polar cap has a diameter of 350 km and a maximum thickness of 3 km. Both polar caps show spiral troughs, were initially thought to form as a result of differential solar heating, coupled with the sublimation of ice and condensation of water vapor. Recent analysis of ice penetrating radar data from SHARAD has demonstrated that the spiral troughs are formed from a unique situation in which high density katabatic winds descend from the polar high to transport ice and create large wavelength bedforms. The spiral shape comes from Coriolis effect forcing of the winds, much like winds on earth spiral to form a hurricane. The troughs did not form with either ice cap, instead they began to form between 2.4 million and 500,000 years ago, after three fourths of the ice cap was in place. This suggests that a climatic shift allowed for their onset. Both polar caps shrink and regrow following the temperature fluctuation of the Martian seasons; there are also longer-term trends that are better understood in the modern era. During the southern hemisphere spring, solar heating of dry ice deposits at the south pole leads in places to accumulation of pressurized CO2 gas below the surface of the semitransparent ice, warmed by absorption of radiation by the darker substrate. After attaining the necessary pressure, the gas bursts through the ice in geyser-like plumes. While the eruptions have not been directly observed, they leave evidence in the form of "dark dune spots" and lighter fans atop the ice, representing sand and dust carried aloft by the eruptions, and a spider-like pattern of grooves created below the ice by the outrushing gas. (see Geysers on Mars.) Eruptions of nitrogen gas observed by Voyager 2 on Triton are thought to occur by a similar mechanism. Both polar caps are currently accumulating, confirming predicted Milankovich cycling on timescales of ~400,000 and ~4,000,000 years. Soundings by the Mars Reconnaissance Orbiter SHARAD indicate total cap growth of ~0.24 km3/year. Of this, 92%, or ~0.86 mm/year, is going to the north, as Mars' offset Hadley circulation acts as a nonlinear pump of volatiles northward. Mars lost most of its magnetic field about four billion years ago. As a result, solar wind and cosmic radiation interacts directly with the Martian ionosphere. This keeps the atmosphere thinner than it would otherwise be by solar wind action constantly stripping away atoms from the outer atmospheric layer. Most of the historical atmospheric loss on Mars can be traced back to this solar wind effect. Current theory posits a weakening solar wind and thus today's atmosphere stripping effects are much less than those in the past when the solar wind was stronger. In spring, sublimation of ice causes sand from below the ice layer to form fan-shaped deposits on top of the seasonal ice. Mars has an axial tilt of 25.2°. This means that there are seasons on Mars, just as on Earth. The eccentricity of Mars' orbit is 0.1, much greater than the Earth's present orbital eccentricity of about 0.02. The large eccentricity causes the insolation on Mars to vary as the planet orbits the Sun. (The Martian year lasts 687 days, roughly 2 Earth years.) As on Earth, Mars' obliquity dominates the seasons but, because of the large eccentricity, winters in the southern hemisphere are long and cold while those in the North are short and warm. It is now thought that ice accumulated when Mars' orbital tilt was very different from what it is now. (The axis the planet spins on has considerable "wobble," meaning its angle changes over time.) A few million years ago, the tilt of the axis of Mars was 45 degrees instead of its present 25 degrees. Its tilt, also called obliquity, varies greatly because its two tiny moons cannot stabilize it like our moon. Many features on Mars, especially in the Ismenius Lacus quadrangle, are thought to contain large amounts of ice. The most popular model for the origin of the ice is climate change from large changes in the tilt of the planet's rotational axis. At times the tilt has even been greater than 80 degrees. Large changes in the tilt explains many ice-rich features on Mars. Studies have shown that when the tilt of Mars reaches 45 degrees from its current 25 degrees, ice is no longer stable at the poles. Furthermore, at this high tilt, stores of solid carbon dioxide (dry ice) sublimate, thereby increasing the atmospheric pressure. This increased pressure allows more dust to be held in the atmosphere. Moisture in the atmosphere will fall as snow or as ice frozen onto dust grains. Calculations suggest this material will concentrate in the mid-latitudes. General circulation models of the Martian atmosphere predict accumulations of ice-rich dust in the same areas where ice-rich features are found. When the tilt begins to return to lower values, the ice sublimates (turns directly to a gas) and leaves behind a lag of dust. The lag deposit caps the underlying material so with each cycle of high tilt levels, some ice-rich mantle remains behind. Note, that the smooth surface mantle layer probably represents only relative recent material. Below are images of layers in this smooth mantle that drops from the sky at times. Smooth mantle covers parts of a crater in the Phaethontis quadrangle. Layering suggests the mantle was deposited multiple times. Enlargement of previous image of mantle layers. Four to five layers are visible. Picture taken under HiWish program. Precession in the alignment of the obliquity and eccentricity lead to global warming and cooling ('great' summers and winters) with a period of 170,000 years. Like Earth, the obliquity of Mars undergoes periodic changes which can lead to long-lasting changes in climate. Once again, the effect is more pronounced on Mars because it lacks the stabilizing influence of a large moon. As a result, the obliquity can alter by as much as 45°. Jacques Laskar, of France's National Centre for Scientific Research, argues that the effects of these periodic climate changes can be seen in the layered nature of the ice cap at the Martian north pole. Current research suggests that Mars is in a warm interglacial period which has lasted more than 100,000 years. Because the Mars Global Surveyor was able to observe Mars for 4 Martian years, it was found that Martian weather was similar from year to year. Any differences were directly related to changes in the solar energy that reached Mars. Scientists were even able to accurately predict dust storms that would occur during the landing of Beagle 2. Regional dust storms were discovered to be closely related to where dust was available. There have been regional changes around the south pole (Planum Australe) over the past few Martian years. In 1999 the Mars Global Surveyor photographed pits in the layer of frozen carbon dioxide at the Martian south pole. Because of their striking shape and orientation these pits have become known as swiss cheese features. In 2001 the craft photographed the same pits again and found that they had grown larger, retreating about 3 meters in one Martian year. These features are caused by the sublimation of the dry ice layer, thereby exposing the inert water ice layer. More recent observations indicate that the ice at Mars' south pole is continuing to sublimate. The pits in the ice continue to grow by about 3 meters per Martian year. Malin states that conditions on Mars are not currently conducive to the formation of new ice. A NASA press release indicates that "climate change [is] in progress" on Mars. 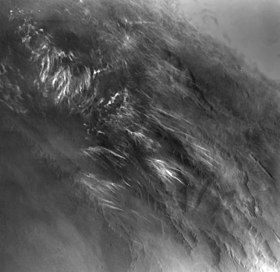 In a summary of observations with the Mars Orbiter Camera, researchers speculated that some dry ice may have been deposited between the Mariner 9 and the Mars Global Surveyor mission. Based on the current rate of loss, the deposits of today may be gone in a hundred years. Elsewhere on the planet, low latitude areas have more water ice than they should have given current climatic conditions. Mars Odyssey "is giving us indications of recent global climate change in Mars," said Jeffrey Plaut, project scientist for the mission at NASA's Jet Propulsion Laboratory, in non-peer reviewed published work in 2003. It has been argued that "observed regional changes in south polar ice cover are almost certainly due to a regional climate transition, not a global phenomenon, and are demonstrably unrelated to external forcing." Writing in a Nature news story, Chief News and Features Editor Oliver Morton said "The warming of other solar bodies has been seized upon by climate sceptics. On Mars, the warming seems to be down to dust blowing around and uncovering big patches of black basaltic rock that heat up in the day." K. I. Abdusamatov has proposed that "parallel global warmings" observed simultaneously on Mars and on Earth can only be a consequence of the same factor: a long-time change in solar irradiance." While some individuals who reject the science of global warming take this as proof that humans are not causing climate change, Abdusamatov's hypothesis has not been accepted by the scientific community. His assertions have not been published in the peer-reviewed literature, and have been dismissed by other scientists, who have stated that "the idea just isn't supported by the theory or by the observations" and that it "doesn't make physical sense." Other scientists have proposed that the observed variations are caused by irregularities in the orbit of Mars or a possible combination of solar and orbital effects. Terrestrial Climate zones first have been defined by Wladimir Köppen based on the distribution of vegetation groups. Climate classification is furthermore based on temperature, rainfall, and subdivided based upon differences in the seasonal distribution of temperature and precipitation; and a separate group exists for extrazonal climates like in high altitudes. Mars has neither vegetation nor rainfall, so any climate classification could be only based upon temperature; a further refinement of the system may be based on dust distribution, water vapor content, occurrence of snow. Solar Climate Zones can also be easily defined for Mars. The 2001 Mars Odyssey is currently orbiting Mars and taking global atmospheric temperature measurements with the TES instrument. The Mars Reconnaissance Orbiter is currently taking daily weather and climate related observations from orbit. One of its instruments, the Mars climate sounder is specialized for climate observation work. The MSL was launched in November 2011 and landed on Mars on August 6, 2012. Orbiters MAVEN, Mangalyaan, and TGO are currently orbiting Mars and studying its atmosphere. ^ Francis Reddy (September 23, 2005). "MGS sees changing face of Mars". Astronomy Magazine. Retrieved September 6, 2007. ^ NASA. "Mars General Circulation Modeling". NASA. Archived from the original on February 20, 2007. Retrieved February 22, 2007. ^ "Clay studies might alter Mars theories". Science Daily. July 19, 2007. Archived from the original on September 30, 2007. Retrieved September 6, 2007. ^ Carr, M.H. ; et al. (1977). "Martian impact craters and emplacement of ejecta by surface flow". J. Geophys. Res. 82 (28): 4055–65. Bibcode:1977JGR....82.4055C. doi:10.1029/js082i028p04055. ^ Golombek, M.P. ; Bridges, N.T. (2000). "Erosion rates on Mars and implications for climate change: constraints from the Pathfinder landing site". J. Geophys. Res. 105 (E1): 1841–1853. Bibcode:2000JGR...105.1841G. doi:10.1029/1999je001043. ^ Craddock, R.A.; Howard, A.D. (2002). "The case for rainfall on a warm, wet early Mars". J. Geophys. Res. 107 (E11): E11. Bibcode:2002JGRE..107.5111C. doi:10.1029/2001JE001505. ^ Aberle, R.M. (1998). "Early Climate Models". J. Geophys. Res. 103 (E12): 28467–79. Bibcode:1998JGR...10328467H. doi:10.1029/98je01396. ^ "Mars Used To Look More White Than Red". Popular Mechanics. May 26, 2016. Retrieved May 28, 2016. ^ "Weather at the Mars Exploration Rover and Beagle 2 Landing Sites". Malin Space Science Systems. Retrieved September 8, 2007. ^ "NASA Mars Lander Sees Falling Snow, Soil Data Suggest Liquid Past". September 29, 2008. Retrieved October 3, 2008. ^ "Mars Clouds Higher Than Any On Earth". Space.com. ^ Pettit, E.; et al. (September 1924). "Radiation Measures on the Planet Mars". Publications of the Astronomical Society of the Pacific. 36 (9): 269–272. Bibcode:1924PASP...36..269P. JSTOR 40693334. ^ Coblentz, W. (June 1925). "Temperature Estimates of the Planet Mars". Astronomische Nachrichten. 224 (22): 361–378. Bibcode:1925AN....224..361C. doi:10.1002/asna.19252242202. ^ "National Space Science Data Center: Infrared Thermal Mapper (IRTM)". Retrieved September 14, 2014. ^ "National Space Science Data Center: Meteorology". Retrieved September 14, 2014. ^ "National Space Science Data Center: Atmospheric Structure". Retrieved September 14, 2014. ^ Eydelman, Albert (2001). "Temperature on the Surface of Mars". The Physics Factbook. ^ "Focus Sections :: The Planet Mars". MarsNews.com. Retrieved September 8, 2007. ^ "NASA Mars Fact Sheet". nasa.gov. 2018. Retrieved November 1, 2018. ^ "Mars Facts". NASA. Archived from the original on June 7, 2013. Retrieved June 20, 2013. ^ Extreme Planet Takes its Toll Jet Propulsion Laboratory Featured Story, June 12, 2007. ^ a b Liu, Junjun; Mark I. Richardson; R. J. Wilson (August 15, 2003). "An assessment of the global, seasonal, and interannual spacecraft record of Martian climate in the thermal infrared" (PDF). Journal of Geophysical Research. 108 (5089): 5089. Bibcode:2003JGRE..108.5089L. doi:10.1029/2002JE001921. Archived from the original (– Scholar search) on September 30, 2006. Retrieved September 8, 2007. ^ a b Gurwell, Mark A.; Bergin, Edwin A.; Melnick, Gary J.; Tolls, Volker (2005). "Mars surface and atmospheric temperature during the 2001 global dust storm". Icarus. 175 (1): 23–3. Bibcode:2005Icar..175...23G. doi:10.1016/j.icarus.2004.10.009. ^ Clancy, R. (August 30, 1990). "Global Changes in the 0–70 km Thermal Structure of the Mars Atmosphere Derived from 1975 to 1989 Microwave CO Spectra". Journal of Geophysical Research. 95 (9): 14, 543–14, 554. Bibcode:1990JGR....9514543C. doi:10.1029/jb095ib09p14543. ^ Bell, J; et al. (August 28, 2009). "Mars Reconnaissance Orbiter Mars Color Imager (MARCI): Instrument Description, Calibration, and Performance". Journal of Geophysical Research. 114 (8): E08S92. Bibcode:2009JGRE..114.8S92B. doi:10.1029/2008je003315. ^ Wilson, R.; Richardson, M. (2000). "The Martian Atmosphere During the Viking I Mission, I: Infrared Measurements of Atmospheric Temperatures Revisited". Icarus. 145 (2): 555–579. Bibcode:2000Icar..145..555W. CiteSeerX 10.1.1.352.9114. doi:10.1006/icar.2000.6378. ^ Clancy, R. (April 25, 2000). "An intercomparison of ground-based millimeter, MGS TES, and Viking atmospheric temperature measurements: Seasonal and interannual variability of temperatures and dust loading in the global Mars atmosphere". Journal of Geophysical Research. 105 (4): 9553–9571. Bibcode:2000JGR...105.9553C. doi:10.1029/1999JE001089. ^ Kleinböhl, A.; et al. (October 2009). "Mars Climate Sounder Limb Profile Retrieval of Atmospheric Temperature, Pressure, and Dust and Water Ice Opacity". Journal of Geophysical Research. 114 (E10): n/a. Bibcode:2009JGRE..11410006K. doi:10.1029/2009je003358. ^ Bandfield, J. L.; et al. (2013). "Radiometric Comparison of Mars Climate Sounder and Thermal Emission Spectrometer Measurements". Icarus. 225 (1): 28–39. Bibcode:2013Icar..225...28B. doi:10.1016/j.icarus.2013.03.007. 2 ice clouds". Icarus. 222 (1): 81–99. arXiv:1210.4216. Bibcode:2013Icar..222...81F. doi:10.1016/j.icarus.2012.10.019. ^ "Wet Mars: Red Planet Lost Ocean's Worth of Water, New Maps Reveal". Space.com. ^ Niles, P.; et al. (2013). "Geochemistry of carbonates on Mars: implications for climate history and nature of aqueous environments". Space Sci. Rev. 174 (1–4): 301–328. Bibcode:2013SSRv..174..301N. doi:10.1007/s11214-012-9940-y. ^ "Search for 'Missing' Carbon on Mars Cancelled". Space.com. ^ Hu, R.; Kass, D.; Ehlmann, B.; Yung, Y. (2015). "Tracing the fate of carbon and the atmospheric evolution of Mars". Nature Communications. 6: 10003. arXiv:1512.00758. Bibcode:2015NatCo...610003H. doi:10.1038/ncomms10003. PMC 4673500. PMID 26600077. ^ "Mars Weather". Centro de Astrobiología. 2015. Archived from the original on October 25, 2015. Retrieved May 31, 2015. ^ "Mars Weather". Twitter.com. Centro de Astrobiología. ^ "Mars Facts". NASA Quest. NASA. Archived from the original on March 16, 2015. Retrieved May 31, 2015. ^ Hoffman, Nick (October 19, 2000). "White Mars: The story of the Red Planet Without Water". ScienceDaily. Retrieved May 31, 2015. ^ Mars General Circulation Modeling Group. "Mars' low surface pressure". NASA. Archived from the original on July 7, 2007. Retrieved February 22, 2007. ^ Mars General Circulation Modeling Group. "Mars' desert surface". NASA. Archived from the original on July 7, 2007. Retrieved February 25, 2007. ^ a b François Forget. "Alien Weather at the Poles of Mars" (PDF). Science. Retrieved February 25, 2007. ^ Mars General Circulation Modeling Group. "The Martian tropics..." NASA. Archived from the original on July 7, 2007. Retrieved September 8, 2007. ^ NASA. "Planet Gobbling Dust Storms". NASA. Archived from the original on June 13, 2006. Retrieved February 22, 2007. ^ Mechanism For Mars Dust Storms 1973, Pollack, Leovy, Zurek. ^ a b c Fenton, Lori K.; Geissler, Paul E.; Haberle, Robert M. (2007). "Global warming and climate forcing by recent albedo changes on Mars" (PDF). Nature. 446 (7136): 646–649. Bibcode:2007Natur.446..646F. doi:10.1038/nature05718. PMID 17410170. Archived from the original (PDF) on July 8, 2007. ^ "Mars Exploration Rover Mission: Press Releases". ^ "Duststorms on Mars". whfreeman.com. Archived from the original on July 19, 2008. Retrieved February 22, 2007. ^ Rapidly intensifying, possibly planet-wide dust storm affecting Mars, 13 June 2018. ^ Shekhtman, Lonnie; Good, Andrew (June 20, 2018). "Martian Dust Storm Grows Global; Curiosity Captures Photos of Thickening Haze". NASA. Retrieved June 21, 2018. ^ Malik, Tariq (June 21, 2018). "Epic Dust Storm on Mars Now Completely Covers the Red Planet". Space.com. Retrieved June 21, 2018. ^ Zurek, Richard W.; Martin, Leonard J. (1993). "Interannual variability of planet-encircling dust storms on Mars". Journal of Geophysical Research. Journal of Geophysical Research. 98 (E2): 3247–3259. Bibcode:1993JGR....98.3247Z. doi:10.1029/92JE02936. Retrieved March 16, 2007. ^ N. Heavens et al. Hydrogen escape from Mars enhanced by deep convection in dust storms. Nature Astronomy. Published online January 22, 2018. doi: 10.1038/s41550-017-0353-4. ^ Eden, H.F.; Vonnegut, B. (1973). "Electrical breakdown caused by dust motion in low-pressure atmospheres: considerations for Mars". Science. 180: 39–87. ^ Calle, Carlos (2017). Electrostatic Phenomena in Planetary Atmospheres. Bristol: Morgan & Claypool Publishers. ^ Forward, K.M. ; Lacks, D.J. ; Sankaran, R.M. (2009). "Particle-size dependent bipolar charging of Martian regolith simulant". Geophysical Research Letters. 36: L13201. doi:10.1029/2009GL038589. ^ Melnik, O.; Parrot, M. (1998). "Electrostatic discharge in Martian dust storms". J. Geophys. Res. Space Phys. 103: 29107–29117. doi:10.1029/98JA01954. ^ Renno, N.O. ; Wang, A.S.; Atreya, S.K. ; de Pater, I.; Roos-Serote, M. (2003). "Electrical discharges and broadband radio emission by Martian dust devils and dust storms". Geophysical Research Letters. 30: 2140. doi:10.1029/2003GL017879. ^ Krauss, C.E. ; Horanyi, M.; Robertson, S. (2006). "Modeling the formation of electrostatic discharges on Mars". J. Geophys. Res. Planets. 111: E2. doi:10.1029/2004JE002313. ^ Di Renzo, M.; Urzay, J. (2018). "Aerodynamic generation of electric fields in turbulence laden with charged inertial particles" (PDF). Nature Communications. 9: 1676. doi:10.1038/s41467-018-03958-7. ^ Aplin, K.L. ; Fischer, G. (2017). "Lightning detection in planetary atmospheres". Weather. 72: 46–50. arXiv:1606.03285. doi:10.1002/wea.2817. ^ Kok, Jasper F.; Renno, Nilton O. (2008). "Electrostatics in Wind-Blown Sand". Physical Review Letters. 100 (1): 014501. arXiv:0711.1341. Bibcode:2008PhRvL.100a4501K. doi:10.1103/PhysRevLett.100.014501. PMID 18232774. ^ Almeida, Murilo P.; et al. (2008). "Giant saltation on Mars". PNAS. 105 (17): 6222–6226. Bibcode:2008PNAS..105.6222A. doi:10.1073/pnas.0800202105. PMC 2359785. PMID 18443302. ^ a b c d "Mars Pathfinder". ^ a b c d e f David Brand; Ray Villard (May 19, 1999). 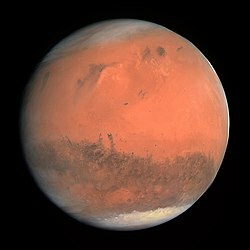 "Colossal cyclone swirling near Martian north pole is observed by Cornell-led team on Hubble telescope". Cornell News. Archived from the original on June 13, 2007. Retrieved September 6, 2007. ^ Michael J. Mumma. "Mars Methane Boosts Chances for Life". Skytonight.com. Archived from the original on February 20, 2007. Retrieved February 23, 2007. ^ V. Formisano; S. Atreya T. Encrenaz; N. Ignatiev; M. Giuranna (2004). "Detection of Methane in the Atmosphere of Mars". Science. 306 (5702): 1758–1761. Bibcode:2004Sci...306.1758F. doi:10.1126/science.1101732. PMID 15514118. ^ Francis Reddy (March 7, 2006). "Titan, Mars methane may be on ice". Astronomy Magazine. Retrieved September 6, 2007. ^ V. Formisano; S. Atreya; T. Encrenaz; N. Ignatiev; M. Giuranna (2004). "Detection of Methane in the Atmosphere of Mars". Science. 306 (5702): 1758–1761. Bibcode:2004Sci...306.1758F. doi:10.1126/science.1101732. PMID 15514118. ^ "Mars Express confirms methane in the Martian atmosphere". ESA. March 30, 2004. Retrieved August 19, 2008. ^ V. A. Krasnopolskya; J. P. Maillard; T. C. Owen (2004). "Detection of methane in the Martian atmosphere: evidence for life?". Icarus. 172 (2): 537–547. Bibcode:2004Icar..172..537K. doi:10.1016/j.icarus.2004.07.004. ^ ESA Press release. "Mars Express confirms methane in the Martian atmosphere". ESA. Archived from the original on February 24, 2006. Retrieved March 17, 2006. ^ Zahnle, Kevin; Freedman, Richard S.; Catling, David C. (2011). "Is there methane on Mars?". Icarus. 212 (2): 493–503. Bibcode:2011Icar..212..493Z. doi:10.1016/j.icarus.2010.11.027. ^ Martin Baucom (2006). "Life on Mars?". American Scientist. 94 (2). Archived from the original on February 23, 2006. Retrieved February 26, 2007. ^ Thomas, Caroline; et al. (January 2009). "Variability of the methane trapping in Martian subsurface clathrate hydrates". Planetary and Space Science. 57 (1): 42–47. arXiv:0810.4359. Bibcode:2009P&SS...57...42T. doi:10.1016/j.pss.2008.10.003. Retrieved August 2, 2009. ^ Tazaz, Amanda M.; Bebout, Brad M.; Kelley, Cheryl A.; Poole, Jennifer; Chanton, Jeffrey P. (2013). "Redefining the isotopic boundaries of biogenic methane: Methane from endoevaporites". Icarus. 224 (2): 268–275. Bibcode:2013Icar..224..268T. doi:10.1016/j.icarus.2012.06.008. ^ Kerr, Richard A. (November 2, 2012). "Curiosity Finds Methane on Mars, or Not". Science. Retrieved November 3, 2012. ^ Staff (September 2012). "Mangalyaan -Mission Objectives". Indian Space Science Data Centre. Retrieved October 8, 2013. ^ a b Chang, Kenneth (December 12, 2007). "Mars Rover Finding Suggests Once Habitable Environment". The New York Times. Retrieved April 30, 2010. ^ Mars General Circulation Modeling Group. "The Martian mountain ranges..." NASA. Archived from the original on July 7, 2007. Retrieved September 8, 2007. ^ "PIA04294: Repeated Clouds over Arsia Mons". NASA. Retrieved September 8, 2007. ^ a b Benson; et al. (2006). "Interannual variability of water ice clouds over major martian volcanoes observed by MOC". Icarus. 184 (2): 365–371. Bibcode:2006Icar..184..365B. doi:10.1016/j.icarus.2006.03.014. ^ Darling, David. "Mars, polar caps, ENCYCLOPEDIA OF ASTROBIOLOGY, ASTRONOMY, AND SPACEFLIGHT". Retrieved February 26, 2007. ^ Mars General Circulation Modeling Group. "Mars' dry ice polar caps..." NASA. Archived from the original on December 2, 2006. Retrieved February 22, 2007. ^ "MIRA's Field Trips to the Stars Internet Education Program". Mira.org. Retrieved February 26, 2007. ^ Burnham, Robert (August 16, 2006). "Gas jet plumes unveil mystery of 'spiders' on Mars". Arizona State University web site. Retrieved August 29, 2009. ^ Kieffer, Hugh H.; Christensen, Philip R.; Titus, Timothy N. (August 17, 2006). "CO2 jets formed by sublimation beneath translucent slab ice in Mars' seasonal south polar ice cap". Nature. Nature Publishing Group. 442 (7104): 793–796. Bibcode:2006Natur.442..793K. doi:10.1038/nature04945. PMID 16915284. Retrieved August 31, 2009. ^ Smith, I. (May 27, 2016). "An Ice Age Recorded in the Polar Deposits of Mars". Science. 352 (6289): 1075–8. Bibcode:2016Sci...352.1075S. doi:10.1126/science.aad6968. PMID 27230372. ^ "The Solar Wind at Mars". Archived from the original on October 10, 2006. ^ Madeleine, J. et al. 2007. Mars: A proposed climatic scenario for northern mid-latitude glaciation. Lunar Planet. Sci. 38. Abstract 1778. ^ Madeleine, J. et al. 2009. Amazonian northern mid-latitude glaciation on Mars: A proposed climate scenario. Icarus: 203. 300–405. ^ Mischna, M. et al. 2003. On the orbital forcing of martian water and CO2 cycles: A general circulation model study with simplified volatile schemes. J. Geophys. Res. 108. (E6). 5062. ^ a b Laskar, J.; Correia, A.; Gastineau, M.; Joutel, F.; Levrard, B.; Robutel, P. (2004). "Long term evolution and chaotic diffusion of the insolation quantities of Mars". Icarus. 170 (2): 343–364. Bibcode:2004Icar..170..343L. doi:10.1016/j.icarus.2004.04.005. ^ Levy, J.; Head, J.; Marchant, D.; Kowalewski, D. (2008). "Identification of sublimation-type thermal contraction crack polygons at the proposed NASA Phoenix landing site: Implications for substrate properties and climate-driven morphological evolution". Geophys. Res. Lett. 35 (4): 555. Bibcode:2008GeoRL..35.4202L. doi:10.1029/2007GL032813. ^ Levy, J.; Head, J.; Marchant, D. (2009a). "Thermal contraction crack polygons on Mars: Classification, distribution, and climate implications from HiRISE observations". J. Geophys. Res. 114 (E1): E01007. Bibcode:2009JGRE..114.1007L. doi:10.1029/2008JE003273. ^ a b Mellon, M.; Jakosky, B. (1995). "The distribution and behavior of Martian ground ice during past and present epochs". J. Geophys. Res. 100 (E6): 11781–11799. Bibcode:1995JGR...10011781M. doi:10.1029/95je01027. ^ Schorghofer, N (2007). "Dynamics of ice ages on Mars". Nature. 449 (7159): 192–194. Bibcode:2007Natur.449..192S. doi:10.1038/nature06082. PMID 17851518. ^ Madeleine, J., F. Forget, J. Head, B. Levrard, F. Montmessin. 2007. Exploring the northern mid-latitude glaciation with a general circulation model. In: Seventh International Conference on Mars. Abstract 3096. ^ a b Steinn Sigurðsson. "Global warming on Mars?". RealClimate. Retrieved February 21, 2007. ^ Jacques Laskar (September 25, 2002). "Martian 'wobbles' shift climate". BBC. Retrieved February 24, 2007. ^ Francis Reddy. "Titan, Mars methane may be on ice". Astronomy Magazine. Retrieved March 16, 2007. ^ "MOC Observes Changes in the South Polar Cap". Malin Space Science Systems. Retrieved February 22, 2007. ^ "Evaporating ice". Astronomy.com. Archived from the original on January 28, 2007. Retrieved February 22, 2007. ^ "Mars Pathfinder". Archived from the original on April 30, 2007. ^ Head, J.; Mustard, J.; et al. (December 2003). "Recent Ice Ages On Mars". Nature. 426 (6968): 797–802. Bibcode:2003Natur.426..797H. doi:10.1038/nature02114. PMID 14685228. ^ Head, J.; Neukum, G.; et al. (March 17, 2005). "Tropical to mid-latitude snow and ice accumulation, flow and glaciation on Mars". Nature. 434 (7031): 346–351. Bibcode:2005Natur.434..346H. doi:10.1038/nature03359. PMID 15772652. ^ Colaprete, A; Barnes, JR; Haberle, RM; Hollingsworth, JL; Kieffer, HH; Titus, TN (May 12, 2005). "Albedo of the South Pole of Mars". Nature. 435 (7039): 184–188. Bibcode:2005Natur.435..184C. doi:10.1038/nature03561. PMID 15889086. ^ Jakosky, Bruce M.; Haberle, Robert M. (1990). "Year-to-year instability of the Mars Polar Cap". J. Geophys. Res. 95: 1359–1365. Bibcode:1990JGR....95.1359J. doi:10.1029/JB095iB02p01359. ^ "Hot times in the Solar System". ^ "Look to Mars for the truth on global warming". National Post. Retrieved March 2, 2007. ^ "Global warming on Mars, ice caps melting". Skeptical Science. Retrieved September 17, 2013. ^ Ker Than (March 12, 2007). "Sun Blamed for Warming of Earth and Other Worlds". Live Science. Retrieved September 6, 2007. ^ Kate Ravilious. "Mars Melt Hints at Solar, Not Human, Cause for Warming, Scientist Says". National Geographic Society. Retrieved March 2, 2007. ^ Hargitai Henrik (2009). "Climate Zones of Mars" (PDF). Lunar and Planetary Institute. Retrieved May 18, 2010. ^ "Curiosity rover touches down on Mars". CBS News.